Handcrafted by the Amish of Lancaster County, Pennsylvania, these beautiful, lightweight wood palettes are inspired by traditional techniques and made of the finest materials. The first truly ergonomic hand-held palettes, feature a unique three-point design that reduces fatigue. 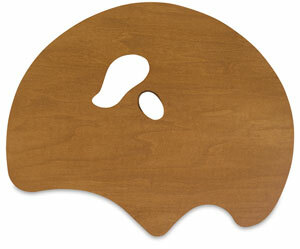 The Grand View Confidant is brilliant for artists who prefer working with a mid-sized palette. With smooth lines and a classic appearance, the Grand View Confidant permits ample space for an assortment of colors and sufficient space for mixing. It features a closed hand grasp with an opening large enough to hold your paintbrushes or a mahl stick. Available in a left-handed or right-handed version, it measures 22-1/4" × 18" × 1/5" and weighs 20 oz. ® New Wave is a registered trademark.